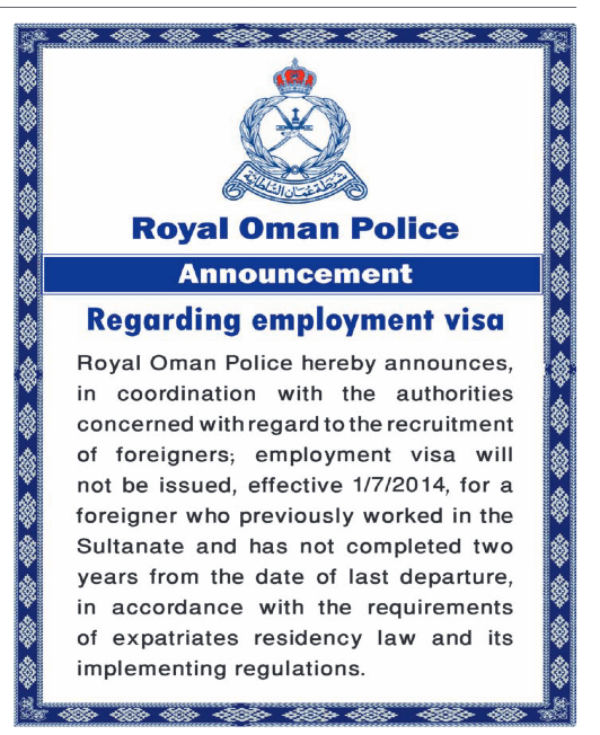 Earlier today I read some good news from Oman that made me feel a bit excited and relieved. The news is irrelevant to those who do read my blog and partially irrelevant to me given the fact that I don't live in Oman (yet). 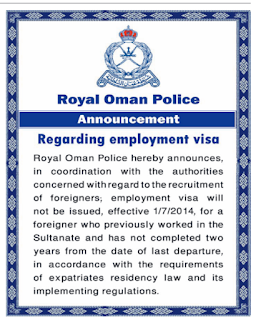 But maybe it can give you some insight into the struggles of expat workers around the world, in this case Oman. I am unaware of the situation before, but when I was in Oman during the last half of 2015, there was a buzz about "The 2 Year Ban." 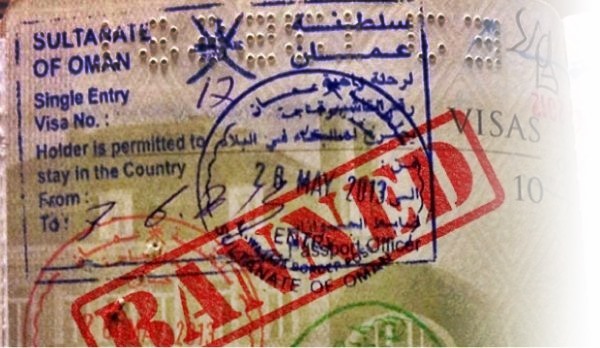 This ban refers to expat workers being forced to leave Oman for at least two years if they are interested in changing their place of employment. The only way they can avoid this two year ban is if their current employer issues them a NOC, or No Objection Certificate. Now you'd think it would be so easy to obtain that letter, but complications can happen and it is a very scary situation to be where you are just stuck in limbo. I also read that even when the employees received the NOC there were so many confusions and red tape that they were still not allowed to receive their new visa and work for the new company. It even said that the previous employers or sponsors were needed to come into the office to sign of the NOC in person. That's a bit awkward and what employer wants to waste their time with their ex employee? The main concern for employers/businesses are the possibilities of the losses they will take when they bear the costs of training and bringing in the new employee. Sometimes the employee quits soon after arriving, or before their contract is up, for a better or higher paying job. This is a concern that should be taken into account, but why should your employer hold your future in their hands after you have completed your contract and responsibilities? In this situation you have two options. Leaving is such a hard option for expats who genuinely love Oman and have built their lives here. Why would an expat buy property or invest if there is no guarantee that you will be able to stay? After spending a decade, or more or less, why would you uproot your life and live elsewhere for two years, and come back just to start from the bottom? If you have family here or are married to an Omani, what choices do you have? (I'm told if you're married there shouldn't be a problem). Why am I asking so many questions?? LOL. Personally I think I would be devastated if I have worked in Oman for lets say four years, have established life there, only to be told that I have to leave. I can't even imagine the headache of selling or moving half way across the world (even less with kids and family), start over, and experience reverse culture shock on top of that. In today's article from Times of Oman, they shared some statistics of the growth and decline of educated expats. The number of expats holding either doctorates, master, any higher education along with current university students have all dropped from the end of 2015 to the middle of 2016. While, those with no education or only to a secondary level, have risen by 200%. An expat with higher education who wants to stay, who has worked in Oman for a long time, has both experience and knowledge in their field along with experience in the country is 100 times better than new employee that may or may not adjust easily to life in the Sultanate, is not familiar with the business culture, and may want to leave as soon as their contract is up. There would be too much turnover in employees for any progress to really culminate and it all just seems so. . . . unproductive. I understand protecting businesses, so there should be a necessity to fulfill your contract, but not allow them to hold it over your head. The exciting news that popped in my feed today is that the Ministry of Manpower is heavily considering removing the need for a two year ban. This is also after other GCC, specifically UAE and. . . . . (I forgot) . . . oh yes, Qatar have began the process to be more flexible with their labor laws. Removing the two year ban is not only a positive for expat workers, but for Oman's economy as it will attract investments and new businesses. “We will remove the NOC option. It will be removed. The plan is being considered seriously,” Said bin Nasser Al Saadi, the advisor to the Minister for Manpower, told Times of Oman in an exclusive interview. So he is saying it will be removed, but right after he says considered, which is a bit confusing. I don't want to be too confident until it is properly announced and the law is amended. Again, it doesn't affect me at all now, but it's good to be aware of the laws and policies. 1/26/16 edit: In January, Ministry of Manpower & Shura Council agreed that the two year visa ban should stay for those without a NOC. But discussions are being held on the details of NOC.